New Scale Technologies has upgraded the lifetime specification and provided new repeatability data for its miniature M3-F focus module, which replaces fixed lens holders in compact board cameras for biometric detection, medical diagnostics, machine vision and other applications. Based on design improvements and testing, the new lifetime specification is >2 million cycles mean time before failure in a fixed orientation or >500,000 cycles in random orientation. 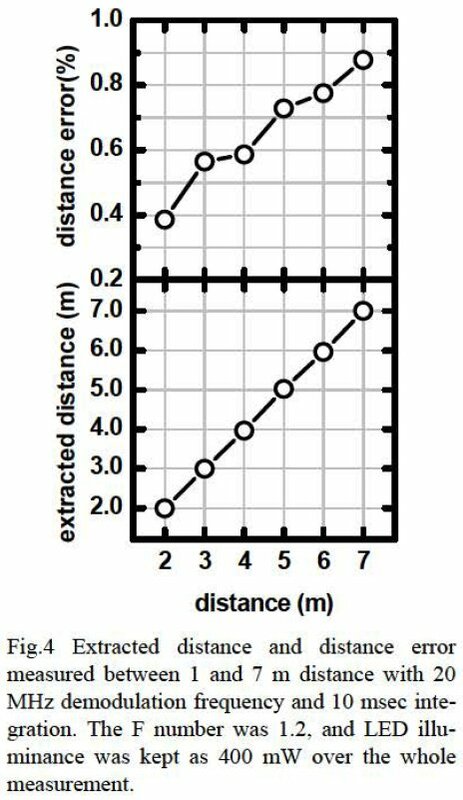 The position repeatability is +/- 5 microns uni-directional and +/- 20 microns bi-directional, which is said to be best-in-class performance for high-resolution imaging applications. We demonstrate chip-scale (< 1mm2) sensor, the Planar Fourier Capture Array (PFCA), capable of imaging the far field without any off-chip optics. 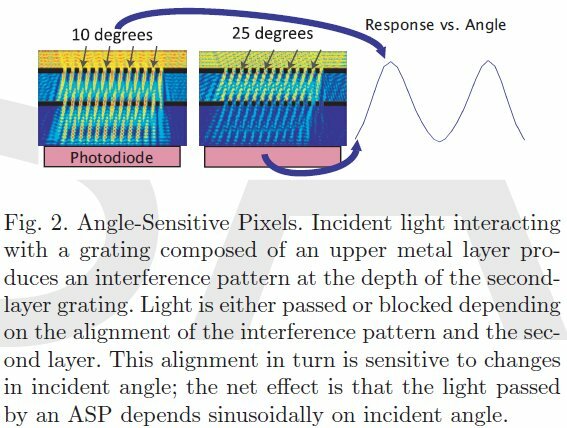 The PFCA consists of an array of angle-sensitive pixels manufactured in a standard semiconductor process, each of which reports one component of a spatial 2D Fourier transform of the local light field. Thus, the sensor directly captures 2D Fourier transforms of scenes. The effective resolution of our prototype is approximately 400 pixels. Thanks to IC for sending me the link! 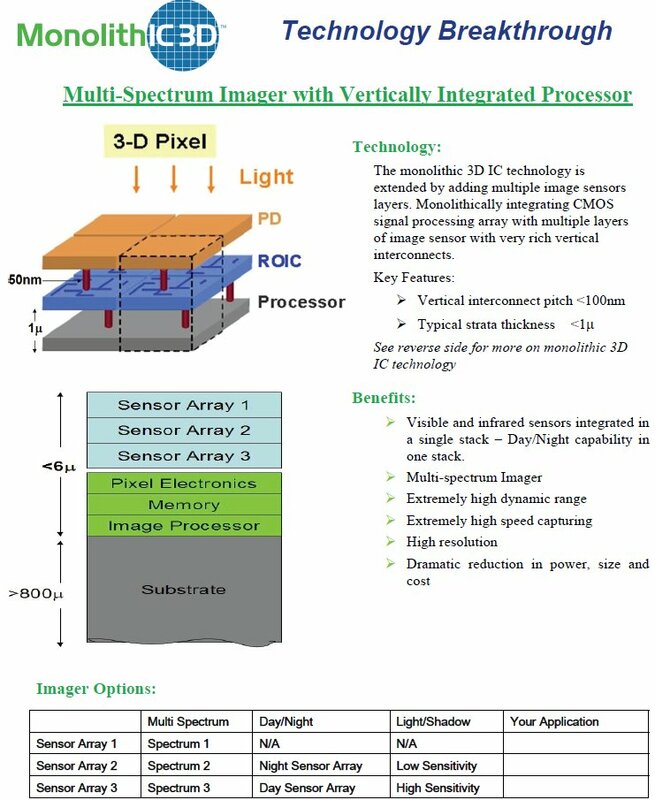 "...sustained solid demand increase for AP and high-pixel image sensors for mobile devices, etc. ...Sales and profitability improved due to sales expansion of dual core AP and high-pixel BSI image sensor, etc. 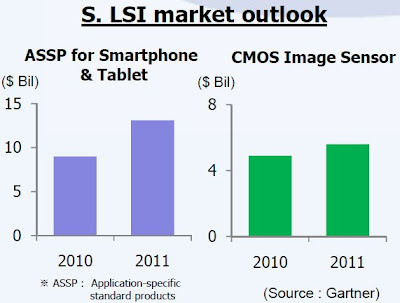 ...Market outlook: Demand for dual core AP, BSI image sensors, etc. to pick up, supported by strong demand for high-end mobile devices." In Q1 Earnings release the company said: "Sales for the System LSI Division doubled to 2.32 trillion won on-year, on the back of rising demand for smartphone application processors and image sensors." The official Q2 Earnings PR is not published yet. "I want to report the our CMOS image sensors we are ready to introduce, 1.1 micron pixel process early next year for 8 megapixel products. We have also demonstrated a 0.9 micron pixel for 16 Megapixel products to be released a year later. Both processes use our world leading (inaudible) elimination [probably backside illumination] technology and are well-positioned for smartphone and tablet application." "The alignment of dopant region 165 to dopant region 135 is not only important at the transfer gate edge. 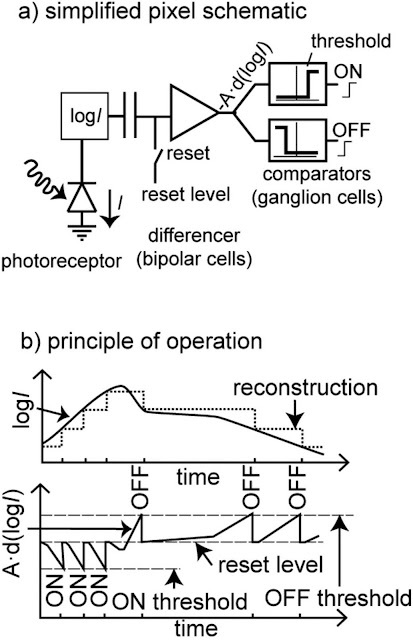 In fact, at all other locations around the periphery of the photodiode it is preferable that pinning photodiode dopant region 165 fully enclose photodiode dopant region 135, i.e., that dopant region 165 preferably extends beyond the borders of dopant region 135. Ion implant shadowing on the sides of the pixel opposite to the transfer gate produces offsets opposite to those provided at the transfer gate edge. The layout design and alignment of photoresist masks 140 and 142 preferably anticipate this in order to meet the above stated preference for placement of dopant region 135. 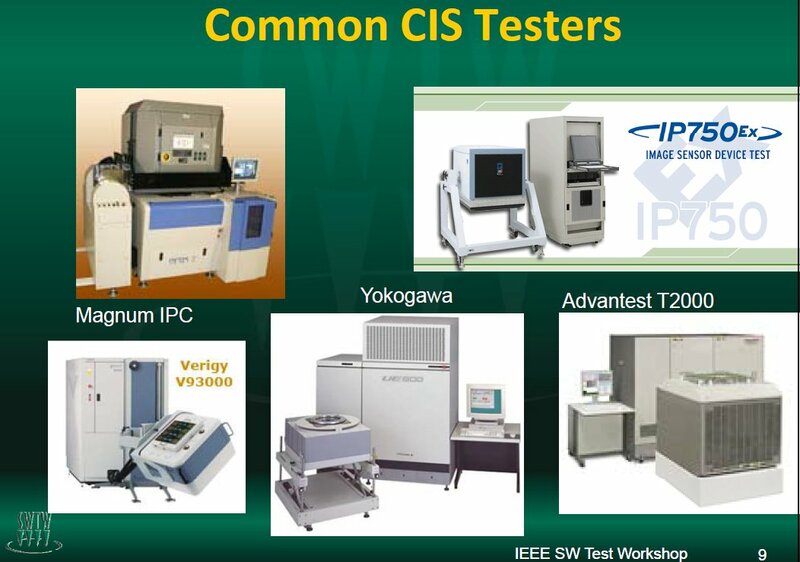 As CIS pixel design and fabrication technologies advance, pixel sizes decrease in order to provide more pixels per unit area. 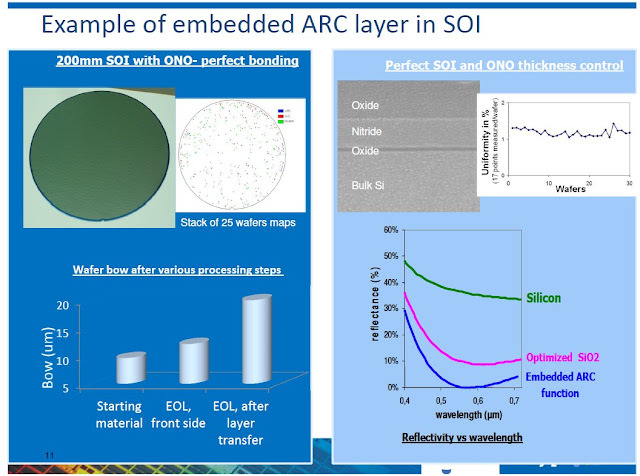 Alignment tolerances often cannot be decreased in proportion to decreases in pixel element dimensions and, in particular for the pinned photodiode pixel elements, the cathode element is made to shrink more than the anode element in order to compensate for retained alignment tolerances. 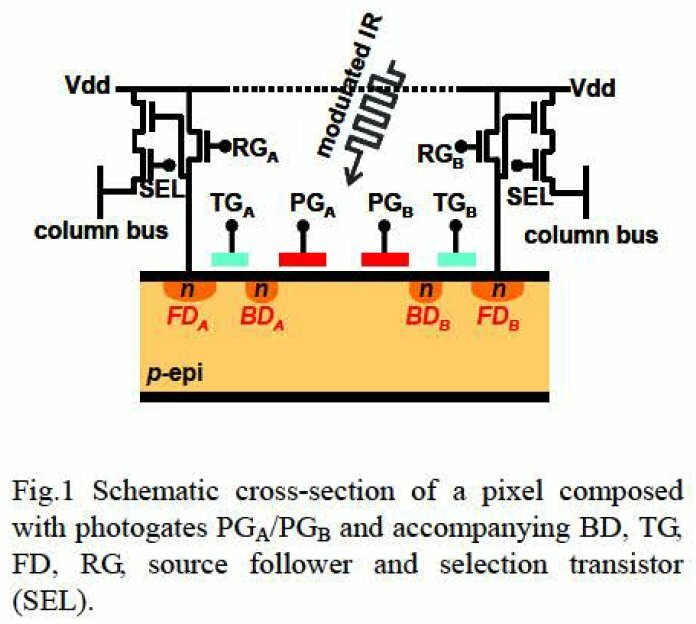 This may result in an accelerated decline of the full well capacity and therefore a decline in performance of the pinned photodiode pixel." "The alignment of dopant regions 535 to 565 is determined by the transfer gate edge in the region adjacent to the transfer gate as in the conventional process. The alignment of dopant regions 535 and 565 in locations other than adjacent to the transfer gate is determined by the self aligned masks as described herein. 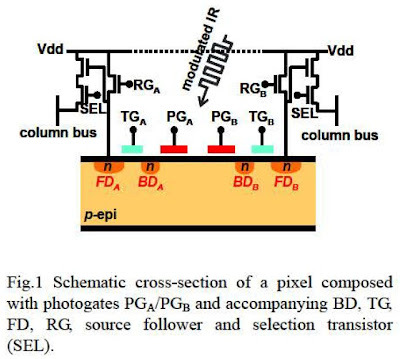 This results in reduced manufacturing cost due to fewer photoresist masks and in larger full well capacity due to a larger pinned photodiode cathode area compared to the conventionally fabricated CIS pixel." 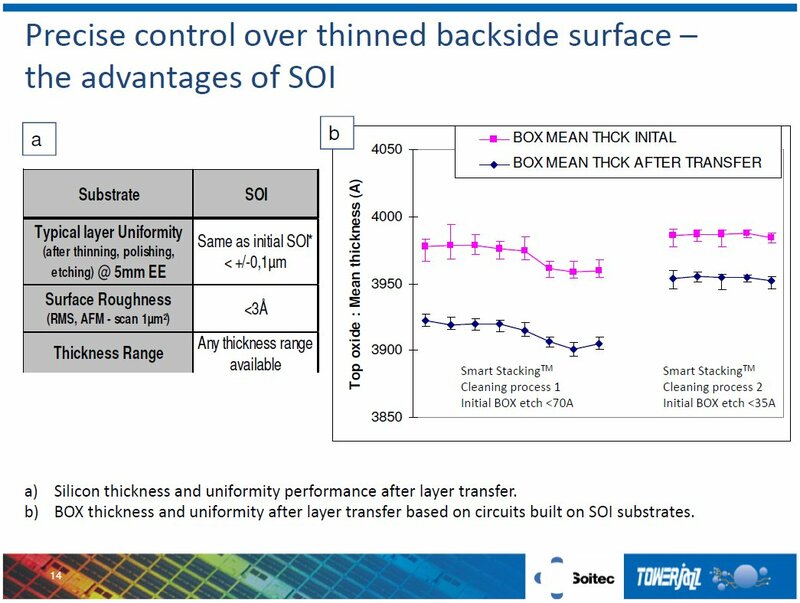 Another version of Omnivision's application talks about transfer gate formation after all photodiode and pinning layers implants are complete. In that case the gate is not self-aligned with the photodiode. IMV Europe: The Vision Award is presented each year at the Vision trade fair in Stuttgart, Germany (held this year from 8-10 November). The innovations presented by the candidates will be judged by a panel of vision experts comprised of Jens Michael Carstensen of Videometer, Hermann Tropf of Vision Tools, Martin Wäny of Awaiba, Dieter-Josef Walter of Daimler, and Michael Engel of Vision Components. SeeBetter intends to build a hybrid vision sensor where pixel electronics die is bump-bonded to BSI photodiode array. 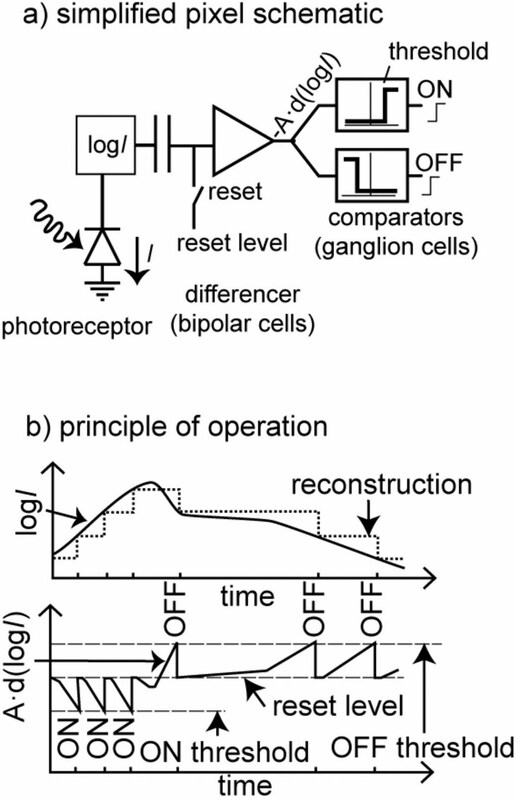 This approach allows to implement a complex retina cell models while maintaining large fill factor of the photodiode array. As stated in comments, Belgium-based Aphesa offers automatic and semi-automatic camera characterization according to EMVA1288 standard. The LED-based light sources cover 395nm-940nm spectral range in up to 12 points. The camera under test should have CameraLink, USB, FireWire or GigE interface. EETimes, PR Newswire: Qualcomm acquired a part of assets of GestureTek, a developer of gesture recognition middleware. The chip maker said it plans to put the gesture recognition technology into its "current and next-generation Snapdragon processors" for smartphones, tablets and other consumer devices. Qualcomm bought unspecified intellectual property assets related to gesture recognition, as well as some engineering resources from Gesturetek. GestureTek retains some of its assets and will continue its business in gesture-enabled digital signs. The companies did not disclose financial details of the transaction. Prior to the deal, GestureTek said it owned eight broad patents on camera- and video-tracking that issued starting in 1996 and said it had applied for 37 others. The company first got its software into handsets in 2007 in a deal with Japan's DoCoMo. It also is used in handsets from HTC, Motorola, Nokia, NEC, Sony Ericsson, Samsung and LG. Licensees for other products include Panasonic, Microsoft (Xbox 360), Sanyo, Sony, IBM, and Intel. Last year the company demonstrated its software running on Android and Symbian environments. It also supports Linux, Nucleus, Windows Mobile and Qualcomm's Brew for feature phones. According to the patent application US20110169055, Himax Imaging works on BSI pixel design. The company proposes non-self-aligned transfer gate on top of pinning layer to achieve low image lag and dark current. 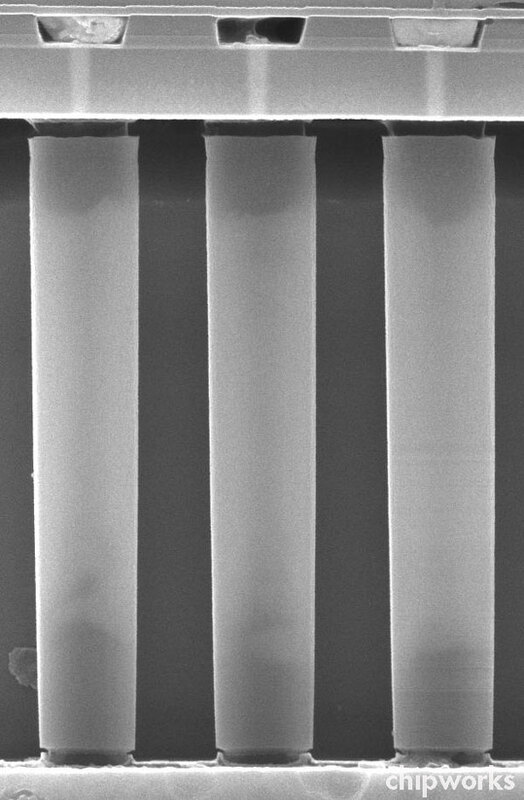 Also, the application says that "BSI red response may be boosted by forming reflection layers by the extended transfer gate poly on top of PD". In-Stat gives few more figures from its 4-month old report "Camera Interfaces Go Serial—Handsets Leading the Way With MIPI". 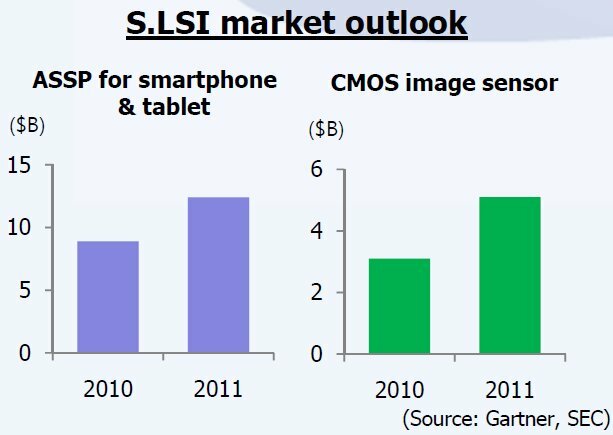 The company is forecasting that the total MIPI CSI market will surpass $3.5 billion in 2016 (probably means TAM of all devices equipped with MIPI interface). Thanks to P.P. for sending me the link! 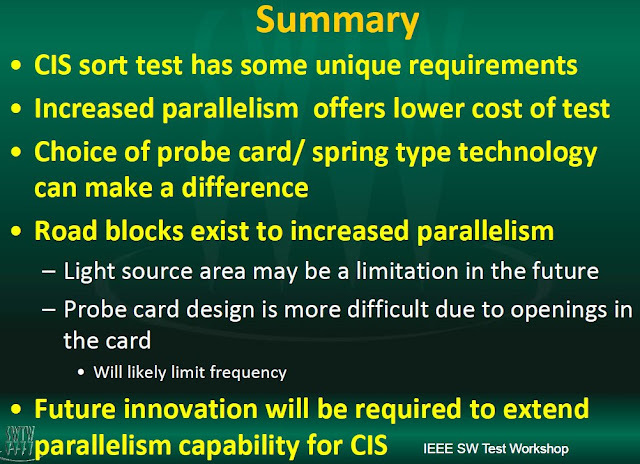 Chipworks presents more details of its reverse engineering analysis of Toshiba HEW4 BSI sensor found inside Fujufilm F550 EXR camera. 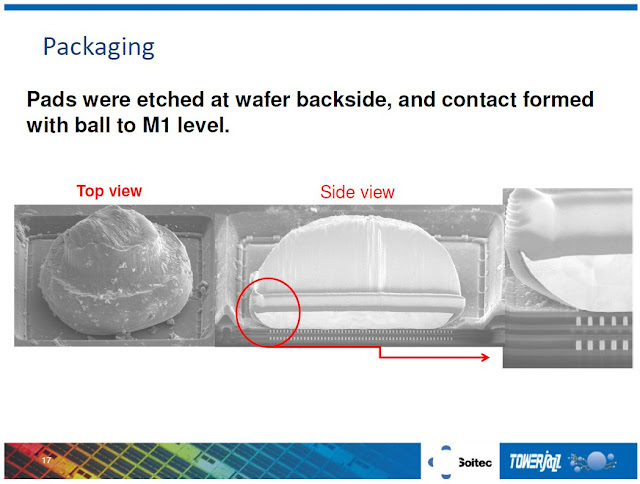 The sensor was fabricated using the Toshiba Oita 300 mm wafer line, using a 65 nm logic process adapted to BSI image sensor production. "The most telling aspect of how the HEW4 BSI chip gets integrated into a chip scale camera module involves the use of very high density arrays of polysilicon filled through silicon vias (TSVs), to form the electrical interconnect between the back side wire bonds and the CMOS integrated circuits on the front of the wafer (Figure 5). These are the first true submicron TSVs that Chipworks has seen deployed in volume production." Chipwork says: "the HEW4 device defines a new category of CIS camera module with its closely packed, poly-filled submicron TSVs that connect the back side aluminum bond pads to the front side copper lines. This technology is non-trivial to implement. 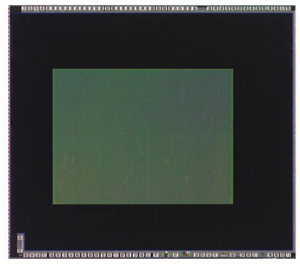 Once mastered and with appropriate economies of scale in play, however, this advanced TSV process saves valuable silicon area and can reduce the size of the camera module." Digitimes: Himax Imaging keeps ramping up its CMOS sensors production for notebooks, according to Digitimes' sources. The new notebook customes include Lenovo and Asustek, in addition to the existing clients like Dell and China-based handset makers ZTE and Huawei. Himax offers VGA, 1.3-, 2- and 3MP sensors for notebook webcams and handset rear camera applications. While this SlashFilm article is dated by April 1st, I hope its content is not a joke. In fact, James Cameron already expressed similar views a year ago. The article digests James Cameron's talk at CinemaCon 2011 in Las Vegas titled "A Demonstration and Exclusive Look at The Future of Cinema". Cameron believes the time has not yet come for the 4K resolution upgrade as most films are currently authored at 2K (especially in the post production stage where most visual effects are rendered at 1 or 2k). Rather, the next revolution in cinema will be to begin shooting and projecting films with faster frame rates. The low frame rate results in a strobing effect when their is moderate camera movement. It looks artificial and your brain interoperates it as such. Raising the framerate makes movement look a lot smoother, and gives the impression of an enhanced resolution. It is also one of the major factors of why some people experience discomfort while watching 3D movies. Cameron talks about 40fps 3D movie: "If watching a 3D movie is like looking through a window, then [with this] we’ve taken the glass out of the window and we’re staring at reality." Cameron isn’t sure what a new standard should be set at — 48fps or 60fps. He mentioned that he will be shooting Avatar 2 at high speeds, either 48 or 60 fps. The high definition video cameras being used for movies today are able to capture images at high framerates, some reaching as high as 220 fps. The second generation digital projectors (basically any projector bought since January 2010) are able to project at very high framerates. In fact, every 3D presentation we see now is being projected at 140 frames per second, projecting each eye a half dozen times. According to Cameron, theater owners won’t need to buy new expensive equipment, as it will only require software upgrades. FirstShowing.net has another version of the same story. "Challenges of CIS High Parallel Test"
Globes: Israel-based gesture recognition company Omek Interactive has raised $7 million in its third financing round, led by Intel Capital. Omek CEO Janine Kutliroff said, "Omek's tools work with all major 3D cameras, enabling our platform customers to take advantage of the latest depth-sensing technologies, and offering software developers a write-once solution for all of these platforms." Omek's technology works with cameras developed by Primesense and Panasonic, as well as Lenovo/Eedoo isec games console. Business Wire: Santa Clara, CA-based startup SiliconBlue announced sampling of iCE40 “Los Angeles” mobileFPGA family targeting mobile and tablet HD video and imaging. The new FPGA devices have capacity in range from 640 to 16K logic gates cells. 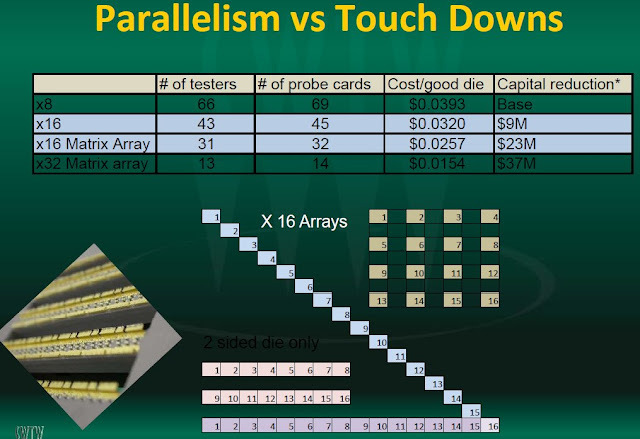 One can ask what kind of image processing is possible with so few gates? As written in comments, there are Kcells, not gates. The product brief gives few suggestions: video scaling, color space conversion, parallel to serial conversion, image rotation. The FPGAs are made in TSMC 40nm standard CMOS process and said to be the industry’s first packaged in 2.5 x 2.5mm micro plastic BGA. Two developments helped us greatly here. 1. Super large f/2.2 aperture allowing approximately 75% more light to reach the image sensor. This is the largest aperture ever incorporated in to a mobile and larger than most digital cameras. 2. 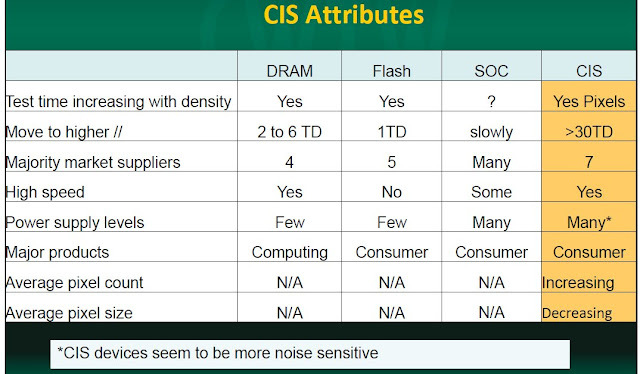 Adoption of the latest generation sensors which provide increased sensitivity as well as improvements in the processing of data resulting in lower visual noise. Combining these improvements, the low light performance between the new Nokia N9 and the N8 is broadly comparable depending on your preference of noise handling." The world’s first demonstration of noiseless infrared avalanche photodiodes (APD in HgCdTe) at room-temperature operation, with a 200x gain at 8V bias and record noise figure of 1.2: these short-wave infrared (SWIR) range (wavelength from UV up to three microns) APD photodiodes will open a wide range of applications. The very first fully CMOS compatible THz pixel’s 2D array: this is a viable route to manufacturing low-cost THz image sensors. 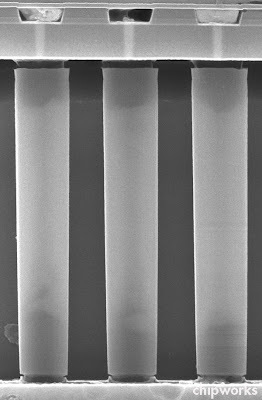 New metallic color filter (RGB: Red, Green, Blue) for visible imagers was realized with a microelectronics-like process on 200m silicon wafers. This RGB filter with an IR rejection also eliminates the traditional IR cutting filter. Collective manufacturing of organic optical lenses on 200mm wafers had been achieved using innovative imprint technology, reducing shape deformation. The quality of these lenses (close to the ideal spherical shape) relaxes assembly tolerance of optical stack of the visible imager. In 2010, Leti demonstrated variable focus lenses (1.5 to 3mm diameter) with an optical power change of 15 m-1 (?) upon 20V electrical actuation. 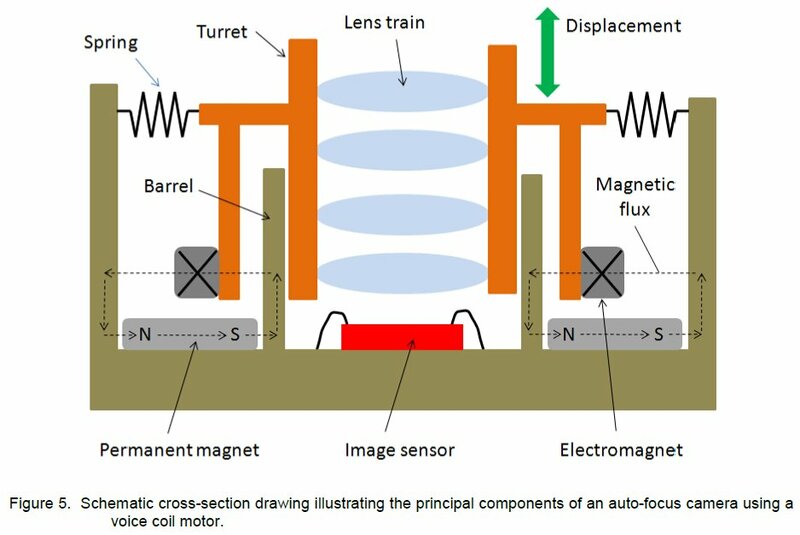 Collective manufacturing of several hundreds of such lenses, over a single silicon wafer, using standard microelectronics processes, promises ultra-low-cost auto focus, zoom or optical stabilization functions for cameras. ESA News: The largest digital camera ever built for a space mission has been painstakingly mosaicked together from 106 separate CCDs. The resulting 1 Giga-Pixel array will serve as the "eye" of European Space Agency's (ESA) Galaxy-mapping Gaia mission scheduled for launch in 2013. The completed mosaic is arranged in seven rows of CCDs. The main array comprises 102 detectors dedicated to star detection. Four others check the image quality of each telescope and the stability between the two telescopes that Gaia uses to obtain stereo views of stars. In order to increase the sensitivity of its detectors, the spacecraft will maintain their temperature of –110ºC. Optics.org: Horten, Norway-based poLight AS, a developer of 0.5mm-thin reflowable autofocus actuated lenses for camera phones, announced raising of NOK100 million ($18.5M), in its series B round led by local Investinor fund with the participation of existing shareholders Viking Venture III AS, Alliance Venture Polaris AS and SINTEF Venture III AS. poLight’s round B of financing could be extended to NOK130M ($24.5M) in the second part of the year with additional investors joining the consortium. poLight has been spun-off from Ignis ASA (acquired by Finisar) in 2009. poLight’s CEO Christian Dupont used to be Varioptic CEO before that. poLight's TLens is said to be the first reflowable autofocus actuated lense with no moving parts and has "extremely small size (4.2mm x 4.2mm x 0.5mm), while achieving high optical quality (megapixel independent and HD compatible)". TLens allows "close-up macro Autofocus (<10 cm) and fast video Autofocus (10 times faster than traditional VCM)". Also, poLight’s "technology makes it possible to manufacture small camera modules at the wafer level, drastically reducing the cost of the TLENS and, as a result, the cost of camera modules". The lens transmittance is said to be over 95%. 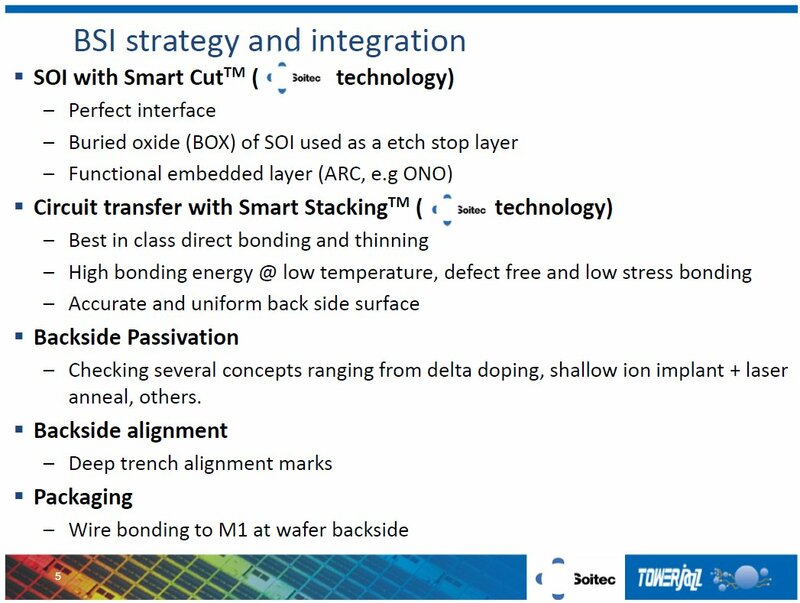 When compared with VCM, today's dominating AF technology, TLens advantages are said to be wafer scale processing, reflowability up to 260C, speed (less than 1ms response time), and energy efficiency (1mW of power consumption). poLight says it has already begun sampling the TLens with a high level of interest. poLight will not be manufacturing the devices itself. Instead it will be co-operating with “leading MEMS semiconductor suppliers”. It expects to enter qualification with customers in late 2011, with volume production starting in early 2012. An embedded a piezo on a thin glass membrane works an actuator. Underneath is positioned some polymer on a glass support. At “zero” volt, the piezo is in standby mode and does not apply any force to the thin glass. The light going through the two elements of glass and through the polymer is not deviated. I would extend the idea to fit a slotted metal electrostatic screen in between the top metals cap and lower pixel layers to ensure that pixel internal caps are uniform across the array. This would require one more metal layer though. Toshiba announced the launch of an 8MP 1.12um pixel BSI CMOS sensor. The new 1/4-inch sensor delivers 30fps at full 8MP resolution or 60fps in 1080p and 720p video modes. The sensor is aimed at smartphone applications. Sampling of the new sensor will begin at the end of July and mass production will follow from the end of 2011. CMOS image sensors are declared to be a focus product of Toshiba's Analog and Imaging Systems business. Update: PR Newswire gives the sensor part number T4K05 and says that the samples are priced at $15. Update #2: Tech-On: The initial production volume is scheduled to be one million units per month at Oita fab. Wall Street Pit, Forbes, Street Insider, Mac Rumors: FBR Capital distributes information that Omnivision may be having technical difficulties with its new 8MP OmniBSI-2 sensor, possibly risking next generation iPhone socket supplier status. The claim is that yield rates at TSMC have thus far been unacceptably low for commercial viability, and that the deadline for inclusion into the next iPhone has passed. Therefore, Sony could become Apple’s primary supplier of 8MP sensors for the next iPhone, with OmniVision possibly being a backup supplier. 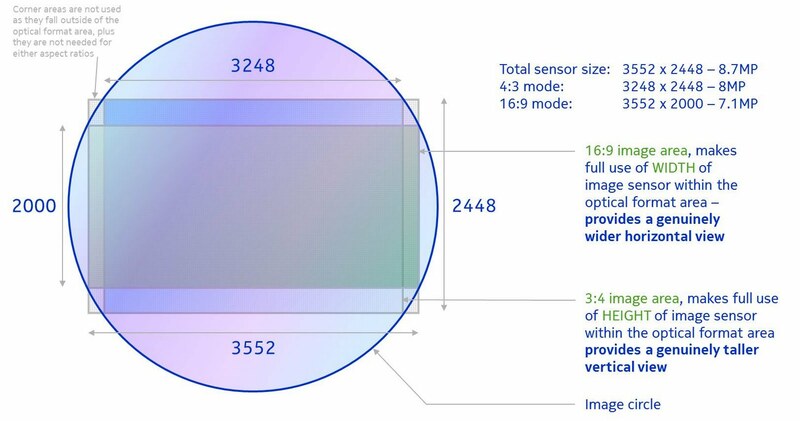 Earlier many analysts claimed that Omnivision will be retaining the status of prime image sensor supplier for iPhone, while Sony would be the second one. It remains to be seen if FBR's Apple supply chain checks are correct. Update: Yahoo: Investment house Detwiler Fenton has learned from sources within OmniVision that it has not lost any Apple business and is the lead supplier of CMOS image sensors to the company. Optics.org: Grenoble, France-based NikkoIA is among the winners in a national contest designed to support small companies with innovative technologies. 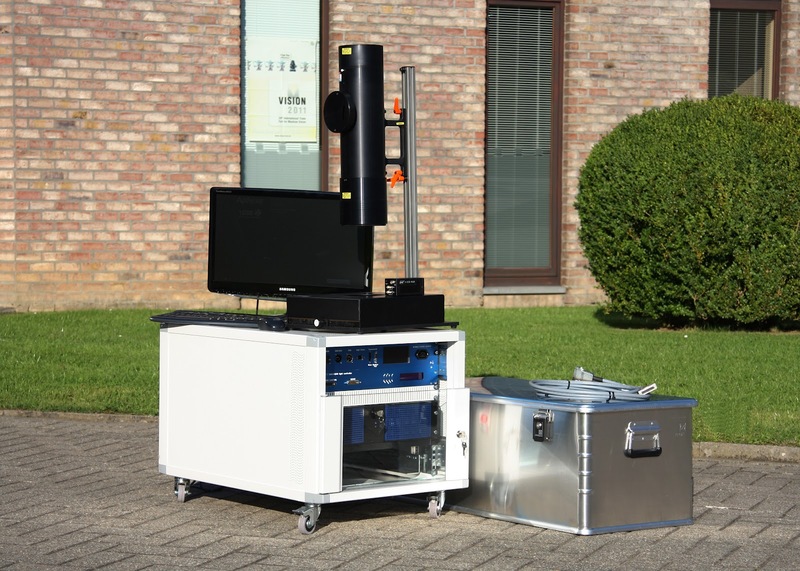 The French Ministry for Higher Education and Research has selected several photonics technologies in its latest national contest supporting innovation and start-up creation. According to the Ministry, the awards program has a good track record: of some 1300 companies either supported or created over the past 12 years, 90% are said to still be in existence. This year, 67 companies winning at the “national” level received an average grant of €215,000. Among the winners is start-up NikkoIA, which is developing a hybrid organic-inorganic structure for infrared imaging applications under a license from Siemens. OpenPR: After Shanghai and Shenzhen shows viimagic sees an interest in the new global shutter HDTV sensors in China. The new 2MP sensors in 2/3” optical format deliver 1080p video at frame rates up to 240fps. With DDS (correlated Digital Double Sampling) processing, frame rates up to 120 fps are achievable. Operated in HDR modes the new viimagic product realizes a dynamic range of more than 120dB. Some customers started already to specify a system concept for applying viimagic global shutter sensors. It shows also that high quality CMOS sensors with high frame rates become more and more important for numerous applications in China. 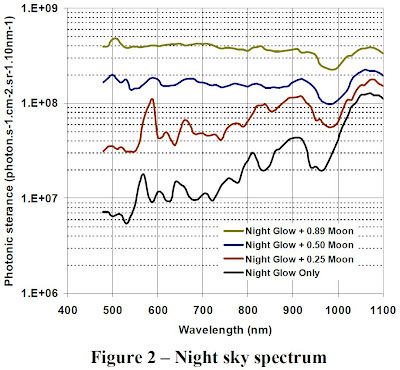 "Light incident on the image sensor 100 constructed as described above may be detected by the first through third light-sensing layers 110, 120, and 130 with respect to color components of the light. For example, the first light-sensing layer 110 may detect all of red, green, and blue light. Part of the light incident on the image sensor 100 travels toward the second light-sensing layer 120. For example, the first filter layer 140 may block only light having blue wavelengths and transmit light having wavelengths other than the blue wavelengths. Accordingly, the second light-sensing layer 120 may detect mostly red and green light. Part of the light passing through the second light-sensing layer 120 travels toward the third light-sensing layer 130. The second filter layer 150 may block only light having green wavelengths and transmit light having wavelengths other than the green wavelengths. 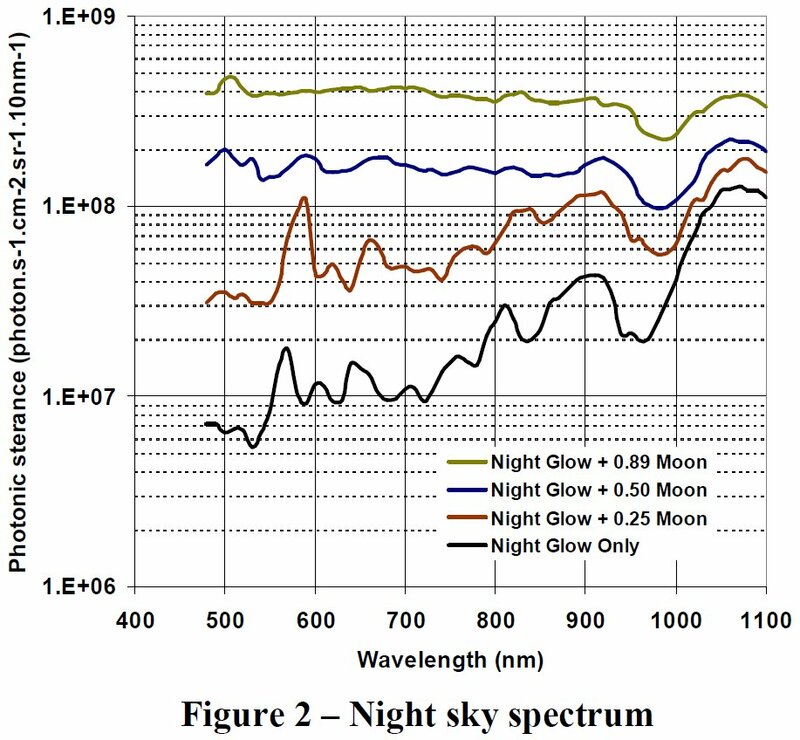 Alternatively, the second filter layer 150 may transmit only light having red wavelengths and block light having wavelengths other than the red wavelengths. Accordingly, the third light-sensing layer 130 may detect mostly red light." Eric Fossum published his IISW 2011 paper "The 25th Anniversary of IISW: Reflections on Directions" talking about the workshop history. Research and Markets' "Global Touchless Sensing and Gesturing Market (2010-2015)" report predicts that gesture recognition market will reach $625M in 2015 from $200M in 2010 at an expected CAGR of 25.6% from 2010 to 2015. The numbers do not make sense to me, as Microsoft has announced that 8M Kinects were sold just in first 60 days. Assuming each Kinect costs $150, the 2010 market should be well over $1B, and 2011 market - much higher than that. VCM typically draws around 250mW continuously during focusing. Although new designs claim to reduce this drain to around 80mW, this is still too high to permit the VCM to be used for anything other than momentary operation during photography. Attempting to capture a video clip with auto-focus operating the entire time would rapidly drain the handset battery. Having such high power dissipation in close proximity to the image sensor can also degrade image quality. The power requirements of a VCM actually increase as the mechanism gets smaller. This effectively places a limit on the minimum size of an auto-focus camera module. The problem is that as the electro- and permanent magnets get smaller, the available magnetic force decreases. For the electromagnet, the field is dictated by the Ampere-turns, while for the permanent magnet it is the volume. Higher power magnets cannot be used due to their cost, so the only method to compensate for a reduction in dimensions is to increase the amperes through the coil, which is highly undesirable due to battery power drain and heating of the image sensor. Another problem with auto-focus mechanisms based on VCMs is speed of actuation. More accurately, the problem is time of settling. A half-stroke jump of 125ìm may only take the actuator a few milliseconds to achieve, but it then bounces about the new set position as the oscillatory magnetic and spring forces diminish to balance. It can easily take 50ms before the oscillations reduce to less than 5ìm and the lens position is considered stable enough for image capture. Tilt of VCMs can be controlled. Some of the options are a longer barrel, more springs, larger springs and more complex springs. As might be expected, all of these in some way impact the power consumption, size or cost so the scope for their implementation is limited.